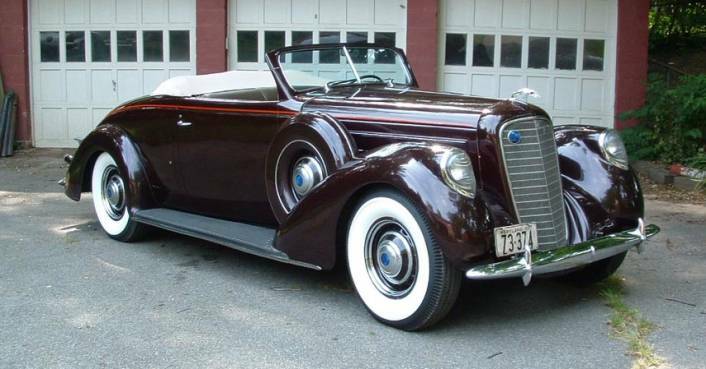 I have found, as time has passed, that my interest in Lincolns (and collectible cars in general) continues to gravitate towards older and older automobiles. I started with a '67 Continental convertible sedan in the late '70s. Then I bought a '69 Mark III. That was followed by a '54 Lincoln Capri convertible. 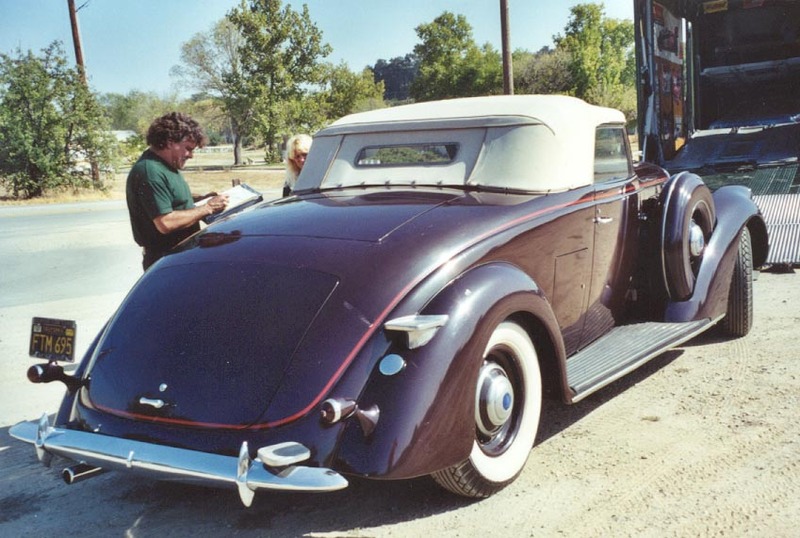 After the '54, I acquired a '41 Continental cabriolet. 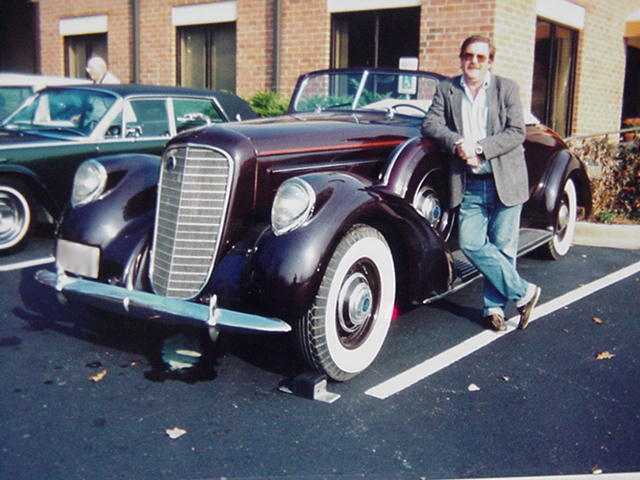 I got bit by the early Lincoln bug at the big meet in Dearborn in 1995. I joined the Lincoln Owners Club shortly afterward, and I have spent a fair amount of time since looking at Ks. This included several cars that I had absolutely no business even thinking about. When asked if I had found a K yet, I kept saying that my car was out there somewhere. I just hadn't found it yet. I first heard about my car through word of mouth. 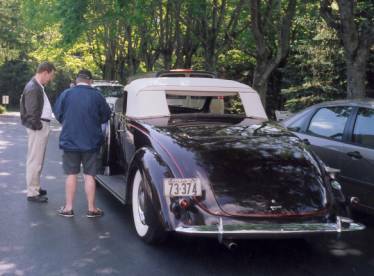 Early last August (1999), I had called John Magill up in Canada to ask a question about the convertible top electrics in my '41 Continental. It took ten minutes to determine that he couldn't answer my question, and we were chatting about other things. 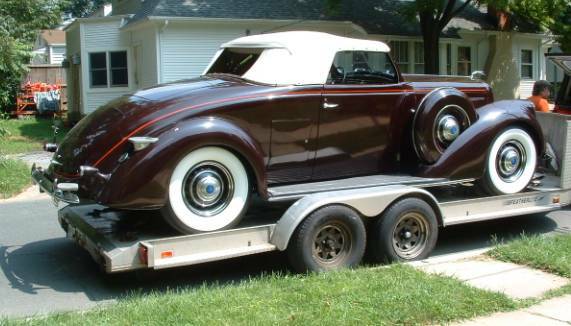 I mentioned that I was waiting to hear from Jerry Beard about a '34 K on Long Island that had been recently advertised in Hemmings Motor News. John said, "You still want one of those? You should call Jim Riffenburgh out in California. He has one he's thinking of selling that you should consider." So I called Jim out in California, and mentioned that John had sent me. Jim asked what I was looking for, and I told him that I wanted a nice presentable, reliable driver. Jim said that was what he had, and began to describe the car. I asked what body style the car was. 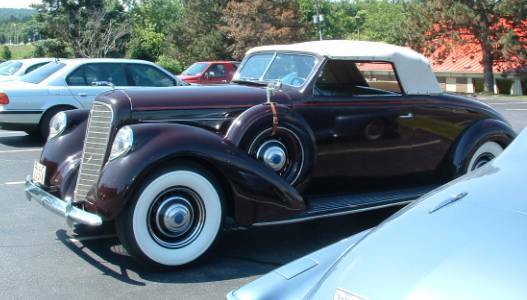 Jim said the car was a '37 LeBaron convertible roadster, and I think I began to drool... I asked what he wanted for the car, and found that the amount was within the realm of budgetary reality (barely). I told Jim that I was going to be flying out West for the LOC National Meet and Pebble Beach, and asked if I could come down and look at the car. He said sure. I showed up at his house in Atascadero about three weeks later. The car was complete and straight, and looked better than I thought it would. I drove the car for over an hour on a hot (90+ degree) day. The engine ran cool, had good oil pressure, and started readily when hot. The steering was nice and tight, the best I've ever felt in a K. Although the brake vacuum booster was not working, the brakes did an excellent job of stopping the car. The structural wood was in good shape and the door hinges passed the "wiggle test". The car just sort of sat there and whispered to me. Jim and I talked for another three hours or so. When our visit was over, I drove up to Santa Cruz to attend the LOC meet and Pebble Beach. I spent most of the remainder of the trip looking at the pictures I had taken of the car, and asking myself if I was willing to sell my Lincoln Continental in favor of the LeBaron. By the time I got back to Maryland ten days later, I had decided that the answer to the question was "No". By the middle of September, I had pretty much put the idea of buying the '37 to rest. Then I found out how much my house was worth. I decided that I wanted the car badly enough to take out a second mortgage on the house. Over the next couple of weeks, several telephone discussions followed. Jim and I settled the deal while sitting in a friend's trailer on the Green Field at Hershey in October. It took another couple of weeks to push the necessary papers and arrange for transfer of the money. Previously, Jim had asked if I was planning to drive the car back to Maryland. I responded by saying that while the car ran extremely well, there was an awful lot of empty space between the Pacific Ocean and the Potomac River, and I would most likely have the car shipped. The car was in transit for nine very nervous days. It arrived here in Maryland early in November (1999), and I didn't get a lot of sleep the night before it arrived. As the economy of the late '30s began to deteriorate again, the market for top-end luxury cars dried up even further. Edsel Ford was quoted as saying that Lincoln did not stop building the Model K, that people simply stopped buying them. Total Model K production in 1937 was approximately 977 cars, compared to 29,997 Zephyrs. 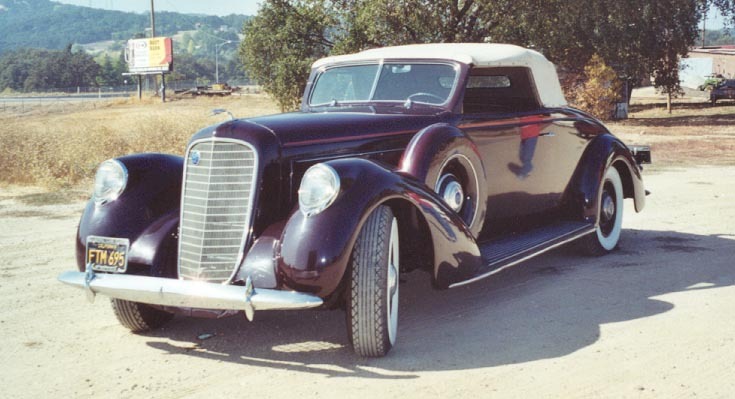 According to published production figures, LeBaron built 15 convertible roadsters, all on the 136-inch wheelbase. The car cost $4,950, and weighs 5,500 pounds. My car is reported to be the only '37 roadster built with sidemount spare tires. My car is serial number K8193, and has roadster body number 14. 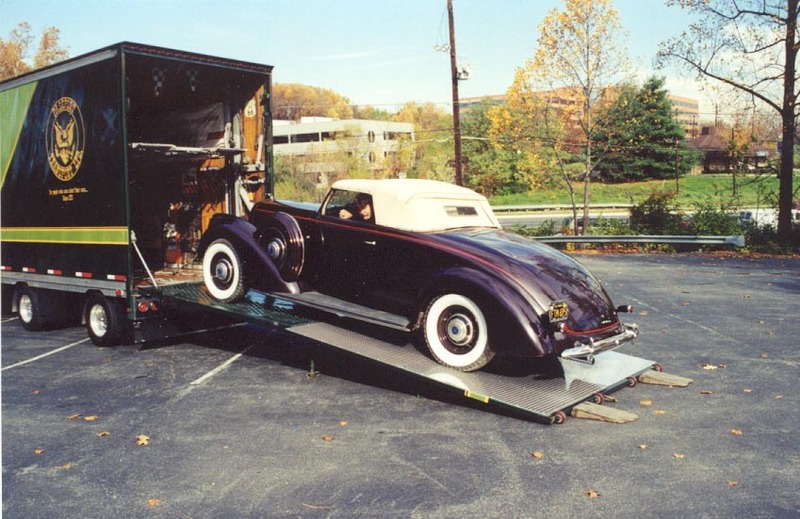 The car was built in the spring of 1937, and was shipped to Long Beach, California on May 7th of that year. I am in the process of researching the history of the car. It seems to have spent its entire life in California. 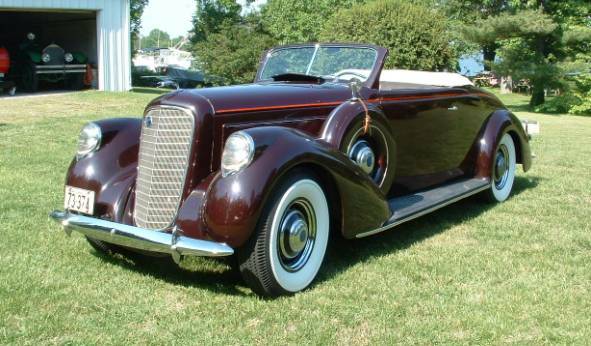 In discussions with several people, I am aware of six '37 roadsters extant, and have heard rumors of a seventh. I have seen three, including the car I now own. The second of the three is painted light green, and is in Minnesota. I tried to buy this car two years ago, but I couldn't get together with the owner on price. The third car is the same color as mine, Ascot Maroon, and is in north suburban Chicago. Of the remaining three cars, one is in a restoration shop in Northern Illinois, the second in Massachusetts, and the third is in Pennsylvania. So now the get acquainted period begins. I do have some work to do to the car, and I will need a fair amount of shakedown time behind the wheel. One of the first items I will need is a set of outside mirrors. With the top up, the visibility to the rear is even more miserable than the '41. I have every intention of driving the car to St. Louis in September. And yes, the top will be down. The above article was written in February, 2000. I spent most of the summer getting the car ready for the trip to St. Louis. There were a number of small items that required attention. The gas gauge didn't work, nor did the speedometer, the windshield wipers, or the dash lights. At the Burn Foundation Concours, June, 2000. The car got her shakedown cruise in mid-June. We drove to Bethlehem, PA for the Burn Prevention Foundation Concours at Lehigh University. I had heard that the Burn Foundation was highlighting the 60th anniversary of the 1940 Lincoln Continental. A friend who knew told me that the turnout of cars was somewhat lower than they had hoped for. I said that my car really wasn't a concours-quality car and was told to apply anyway. So I did, and the car was accepted. It was my first time entering a car in a fancy concours d'elegance. I had a great time, the car made the drive out and back without incident, and was well-received. The above picture was taken at that meet. The water pump constantly piddled coolant out of the input shaft, and was sent off to be rebuilt. The generator stopped working on the 4th of July and was also sent off to be rebuilt. The gas tank was sent out to be boiled and sealed. The float on the gas gauge sending unit was replaced. The speedometer was sent out to have a frozen bushing replaced. The chassis was greased, fluids checked and replenished. Since the engine ran so well, I decided not to perform a tune-up. During the trip, I was quite pleased with the way the car ran, but was dismayed at the fuel consumption (7-8 mpg at 60 mph) and the oil consumption (1 quart every 100 miles). I also noticed that the freshly-rebuilt water pump was again seeping coolant, this time out through the lubrication fitting. Because of this, I got in the habit of topping off the coolant every morning. When I did this on the morning of the last day, I found evidence of oil in the coolant. Bummer. A few people said that I could probably drive the car home like this, but I decided to play it safe. I would rather spend $700 for transportation than risk a $15,000+ engine rebuild. I had the car shipped back to Maryland. We cut to the day the car came off the truck. The best drop-off point is a church parking lot about a mile from the house. I made it about halfway home, and then I lost the left bank of cylinders. In diagnosing and fixing this problem (a bad ignition condenser), I lost the right bank of cylinders. I limped the car to a local show (she will run on six cylinders, but she ain't happy), and then decided to give the car a major tune-up. I replaced the rotor, spark plugs, wires, contact points, and the other condenser. I had the carburetor and fuel pump rebuilt, and the distributor strobed. Ten months later, I finally have the car back on the road. And of course, I have to get comfortable with the car again. 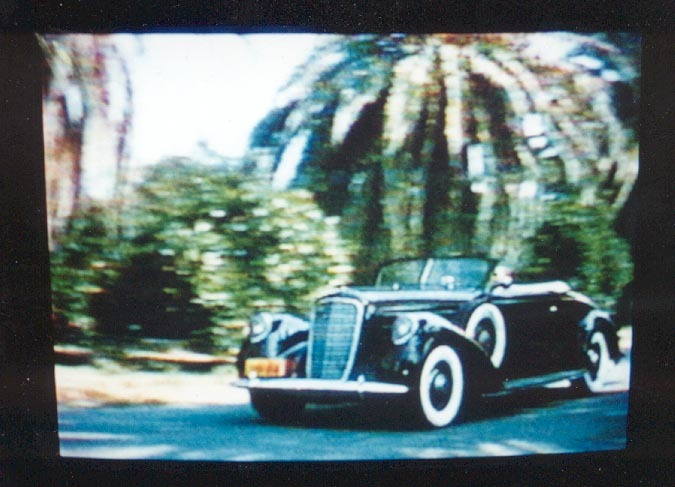 I had been told that the car had appeared in the movie "With a Song in My Heart". The movie was about the singer Jane Froman and was made in 1952. It took a while, but the movie was finally broadcast on AMC. I took the picture below from the television screen. Looks familiar, doesn’t it? 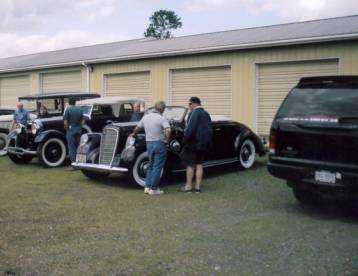 I was on my way with two other cars to a local Packard Club meeting up north of Thurmont, when the K left me on the side of the road for the first time. We were climbing a gentle hill. The car hesitated and coughed, and then quit. At first, I thought that the electric fuel pump had packed in. Then I found that the electric pump wasn't getting any fuel out of the tank. I had the car towed home. One week later, I connected the battery and turned on the fuel pump. The tone of the pump changed as it began to pull fuel out of the tank. A few seconds later, the pump stopped chattering. I pulled the choke and pushed the starter, and the car fired. So now I know where the problem is. Shortly before I left for Europe, I removed the gas gauge sending unit to siphon the tank. I found that the float had been replaced with two corks glued back-to-back. Whatever adhesive was used on the corks was obviously not impervious to gasoline, as the float was covered with this diaphanous black goo. While siphoning the fuel out of the tank, I put it through a paint strainer, which picked up more of the stuff. I dropped the tank and sent it out again. The day before I left for Europe, I got a call from the garage. I was informed that the 'impervious to everything' coating in the tank was coming apart. I told the proprietor that he had five weeks, and that I wanted the tank back painted in primer (it came out of the car body color and I wanted to put it back the same way). It's been a cold, snowy winter, cold enough to motivate me to not go out to the garage. During the past year, the K has been mostly "resting". I pulled the gas tank for cleaning and resealing in April. I wrestled the tank back into the car in July, and discovered that the gas gauge would not register (again). Various attempts to troubleshoot the problem yielded no positive results. I have been contemplating re-wiring the car this spring. I am not entirely pleased with some of the connections, and the existing harness and wire colors bear no resemblance to what is supposed to be installed. A related bit of food for thought has been how to install turn signals in the car. The most unobtrusive way to do this would be to put the turn signals in the taillights (rear) and parking lights (front). Fine, except for the fact that the car doesn't have front parking lights, because someone in the past replaced the factory headlights with sealed-beam bulbs. With the lenses on the car, you can't tell unless you know exactly what to look for. A friend with a '37 Willoughby Sport Sedan purchased bullet lights from a Harley-Davidson store and installed them on the bumper brackets. The switch and indicator lights were installed under the lower left-hand corner of the dashboard. I'm still contemplating this, but a deadline continues to approach: The Ford Motor Company Centennial celebration is scheduled for the middle of June, and I have hopes of taking the K to this meet. The new wiring arrived in March, and of course the following two weeks were cold and drizzly and rainy. The re-wiring job is about half done. Of course, I saved the worst for last (the body harness). We are still aiming for Dearborn in June. I expect we will make it. I was able to get the car completed in time to attend The Ford Centennial. Unfortunately, due to the monsoons we had been having in Maryland, I was not able to get the shakedown time in that I had hoped for. I was a very nervous person when we pulled out of the driveway. Aside from a minor coolant leak, we made the trip without incident. We also won the longest distance driven trophy from the Lincoln Owners Club. Coming home, we made it about halfway, and then the coolant leak got abruptly worse. 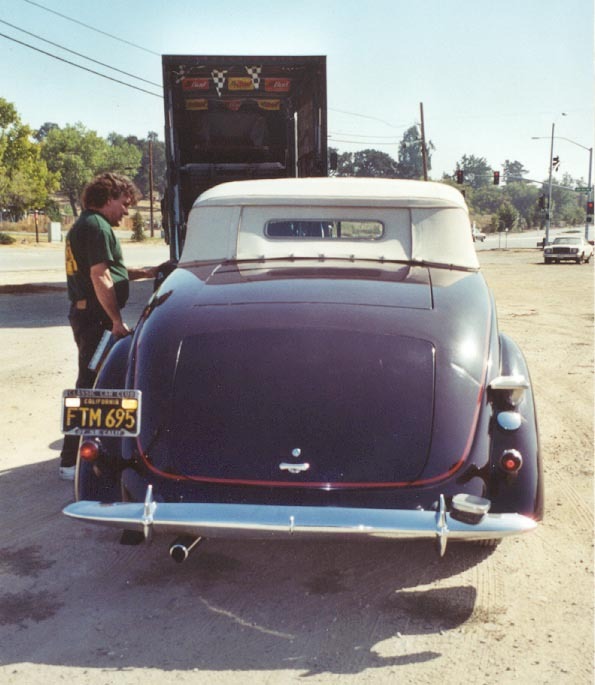 I was caravanning with a friend who was kind enough to put his 1938 Lincoln on the ground, and my car went the remaining 250 miles in the back of his trailer. We are still looking into the source of the leak. 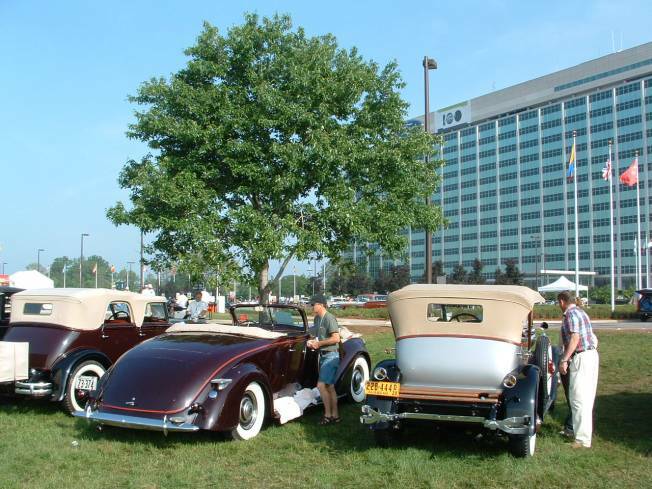 On the show field in front of Ford World Headquarters. Taken in late June, 2003. After a bit of thrashing around, I learned that the problem was a badly blocked radiator. A friend suggested that I might have a bad pressure cap, and I began to make some phone calls to locate same. The proprietor of a local radiator shop suggested that I bring the car in and they would take a look at it. They performed a test for hydrocarbons in the coolant, and told me that the head gaskets were okay. They ran the engine up to operating temperature and then check the temperature of the top and bottom tanks: upper was 205 degrees, lower was 190. That’s both too high, and not enough of a differential. The shop then said they would need to take the radiator out of the car to pressure and flow test it, and mentioned that they might have to rod the radiator. To make a long story short, I had to have the radiator re-cored at some considerable expense. This has been completed, and the re-installation of the radiator is waiting for an extra couple of pairs of hands. On the lawn at Judge John North’s. With the car reasonably well shaken down, it was time to hit the road to Hawley, Pennsylvania, and the LZOC/LOC meet. At least this time I was able to pull out of the driveway without being scared half to death. She ran wonderfully, up and back. In Harrisburg, en route to Hawley. Above and below, on the Thursday tour. During the past few years, I learned that three old cars was at least one too many. Since I acquired the third toy, I found that I would drive number one, work on number two, and basically ignore number three. Add to that the fact that my job has been rather consumptive of my weekends this year. So it was time to reduce the collection. I was having a hard time deciding which one to sell. I put both the Packard and the K up for sale. To my complete surprise, the K sold almost instantly. She went off to a new home today. I hope her new owner has as much enjoyment with her as I had.